Portfolio - Deitz House Moving Engineers Inc.
Deitz House Moving is pleased to offer a wide range of expertise. Browse our gallery and portfolio to see a variety of specialty projects and recent completions by our dedicated structural moving engineers. This structure was built in the early 1990's atop a shifting sand dune overlooking Lake Michigan. The structure captured the crest of the dune with the front and back yard sloping away at greater than a 45 degree angle. Over the years, the home settled and shifted due to the landscape and the center of the structure sagged due to inadequate support footings. Deitz House Moving Engineers was commissioned to design and implement a noninvasive supplemental support system. The Deitz team of professionals designed a sophisticated system to bridge the existing footing and enable the house to remain intact. Deitz House Moving fabricated custom support steel, columns, and stanchion for this project. Finally, Deitz installed concrete grade beams and fitted all structural steel. This home will sit atop one of West Michigan’s most beautiful locations for years to come. 1.1 million pound Spanish Colonial Mansion relocated by the Deitz House Moving Engineers team. Read more about this incredible move at mlive: House movers roll East Grand Rapids mansion to new spot, make room for new construction. Top heavy, 4,000lb. "Marsh Edge" Sculpture finds a new home in Grand Haven, Michigan. 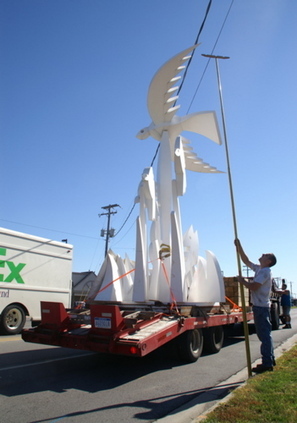 Learn more about moving this unique sculpture at mlive: Sculpture moves to temporary storage. 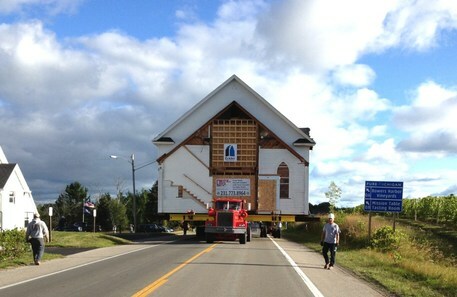 Massive century old St. Joseph Church moved from Mission Peninsula. Read more about this project at UpNorthLive: Historic Church Is On The Move.